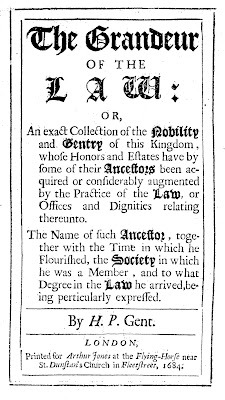 An exact collection of the nobility and gentry of this kingdom whose honors and estates have by some of their ancestors been acquired or considerably augmented by the practice of the law or offices and dignities relating thereunto. Edward Tildesly of Morlies (FN1) in the County of Lancaster, Esq;, is the Son and Heir to that great patern of Loyalty and Valour, Sir Thomas Tildesly of Morleys aforesaid, Knight, who being in Arms on the behalf of his late Majesty; after many brave Actions by him achieved, had the hard fate at last to dye in the Bed of Honour, being killed in the Road near Preston in Lancashire, fighting stoutly in his Princes Service; after which, his Body was buried in the place where it fell, under a heap of Stones there remaining as a monument to perpetuate his memory, it being a Custom amongst the Ancient Romans, to erect such as marks of Honour where any great Action was performed: which said Sir Thomas Tildesly was descended, by many renowned and honourable Ancestors of this County, from Thomas Tildesly Esq;, a person famous for his great Judgement in the Laws of our Nation, and called to the dignity of a Serjeant at Law by King Henry the Fourth, and from whom also did descend another Sir Thomas Tildesly of Grays-Inn, Knight, one of the Readers thereof, and one of the Council in the North in the Reign of King James, but he dyed without Issue Male. The inclusion of Thomas Tyldesley who died in 1410 and Sir Thomas Tyldesley 1557-1635 is hardly surprising—both were members of Grays' Inn and they were successful and prominent lawyers. Sir Thomas Tyldesley 1612-1651 did not practise law, but the Gray's Inn Admission Register records that he was admitted on 20 November 1622 at the age of 10 for his education. Edward Tyldesley 1635-1685, however, is not known either to have practised law or to have belonged to an Inn of Court—though he was undoubtedly a well-known figure of his time. Sir Thomas Tyldesley 1612-1651 was not buried under "a heap of Stones". Rather he was buried in the Tyldesley Chantry Chapel of St Nicholas at the Parish Church of St Mary the Virgin at Leigh. Philipps may be basing his account on the monument to Sir Thomas Tyldesley in Wigan Lane. However this monument was erected some 28 years later in 1679 by Alexander Rigby, then High Sheriff of Lancashire, who had served as Cornet under Sir Thomas Tyldesley. Thomas Tildesley, gent., son and heir of Thomas Tildesley, Esq., now reader. Richard Tildesley, son of Thomas T., of Orford, co. Lancaster, Esq. Rowland Tildesley, son of Thomas T, Knight, one of the readers.